Dathan Ritzenhein talking about the World Half Marathon in a LetsRun.com Recommended Read. DyeStat writer Matt McCue spent a day with Ritz as he trained for his next big race, which looks like it will be IAAF World Cross Country in Poland. Hayley Yelling Pulls Off Shocker At 35 Yelling is a school teacher and retired a year ago after bombing at Euro Cross. She came back because she wanted to be back. Euro Men's Recaps All In One Place Sergey Lebid to us is the most interesting story as he took 3rd. In 16 years of Euro Cross, there have only been 6 different winners thanks to the Ukranian winning a remarkable 8 senior titles. Euro Women's Recaps Steph Twell, who the British press took to calling "the next Paula Radcliffe," fell apart in the U23 race. 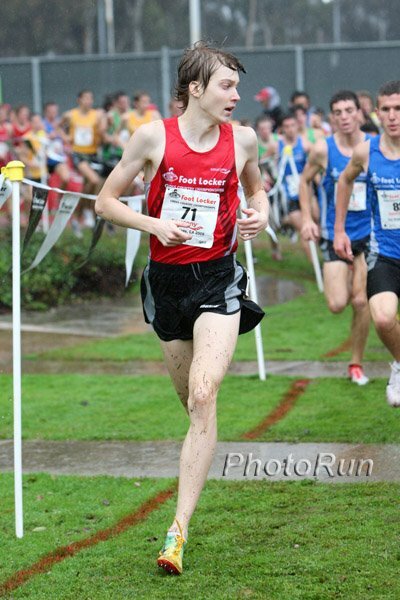 Matt McCue spends a day with Dathan Ritzenhein in Portland. Ritz seems to be in a good situation where his hard-working mentality is channeled into the right training every day. When McCue was there Ritz ran both runs on the Alter-G in the garage of the Nike house where Alan Webb lives. The big news is that Ritz is gunning to run world cross country in March. Clenching of the teeth and tightness in the jaw can signal stress to the rest of the body. Though still relatively undocumented, anecdotal claims are creeping in to the media like this story in the New York Times about the effectiveness of this new training and racing gadget that sits over the teeth and aids in relaxation. Our question is, does the extra cortisol release aid elites or is this just a trick for stressed out people running 10 minute miles? This isn't a big deal right now but who knows what will come out when the computer records are searched. Dr. Anthony Galea doesn't even have a license to practice in the US but was instructing his assistant to transport HGH, commercialized calf's blood and syringes across international borders when she was detained by police. In about a week the hi-tech swimsuit that has caused every swimming world record to be broken about 8 times is going to be banned. In the meantime the US swam against the UK and Michael Phelps set a new butterfly world record. It will be amazing to compare the number of world records set in swimming in 2008 and 2009 compared with 2010 and 2011 (to be fair maybe we should include an Olympic year). Times London Asks - How Was Phelps Not The Athlete Of The Decade? We ask: how is any golfer ever considered the athlete of the decade? Rupp completed the Rupp-tet by winning the indoor 5k, 3k and DMR and team title plus the outdoor 5k and 10k. He also won cross-country individual and team title but that wasn't included in the voting. This seems like a cruel version of media irony. He's the man who gave China's our money to Wall Street. Usain Bolt was 5th in the voting. Usain Bolt A Finalist For Time Magazine's Person Of The Year Announced today, no sportsperson has ever won Time's yearly award. Technically though, "You" or "I" or "We" won in 2006, so sportspeople have won. Though they don't have enough hard evidence to convict her of anything, the IOC refused to give Thanou Marion Jones' 100m medal from Sydney to mark the first time in Olympic history no gold medal was awarded in an event.